It's the middle of august,only a few weeks left until the end of the summer 😟and I am not ready to let it go. Summer is my favorite season,inspires me. I love summer not only because of the warm weather but also because of the fantastic summer produce available at farmers market. Warm weather always increases my appetite for fresh,light meals and some of my favorite fruits like peaches and melons are only available this time of the year. It's been a capricious summer here in north,with more low temperatures than hot weather. With an average temperature of 25ºC, 10 degrees Celsius below than normal,the season felt more like spring rather than summer although,the grocery stores are bursting with gorgeous seasonal fruits and vegetables. Last week while I was at farmers market looking for some inspiration for the dinner, I spotted some ripe yellow peaches. I picked up one and instinctively smelt it. Oh,that sweet aroma convinced me to buy them. They are delicious raw,as they are, but they're also good for baking and during the summer I always make cold or baked fruit desserts. 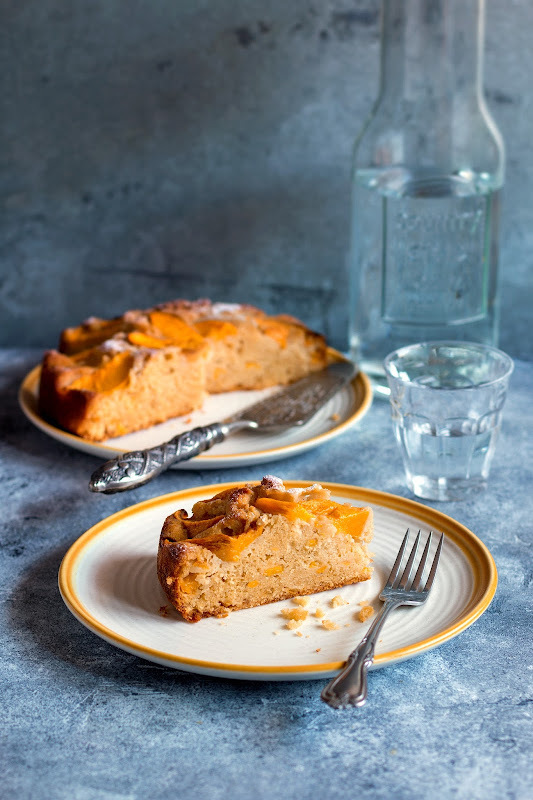 With september just around the corner and thinking that these peaches are probably the last of the season, the desire of baking a cake was huge. Leafing through my notebook,filled with handwritten recipes,a recipe caught my eye,a recipe I made many times before. I made slight changes from recipe but still moist and delicious. Preheat oven to 180ºC/350ºF.Lightly butter bottom and side of a 23 cm (approx.9-inches)springform pan.Line the botton and the side with parchment paper. Sift together flour,salt and baking powder and set aside. Put butter and the sugars into a large bowl.Beat with an electric mixer until creamy. Add the crème fraîche,vanilla extract and beat briefly,just until evenly incorporated. Add the eggs,one at a time and beat for15-20 seconds after each addition. Using a rubber spatula fold in the flour mix,be careful to not overmix the batter. Add diced peach to the batter and gently fold to combine. 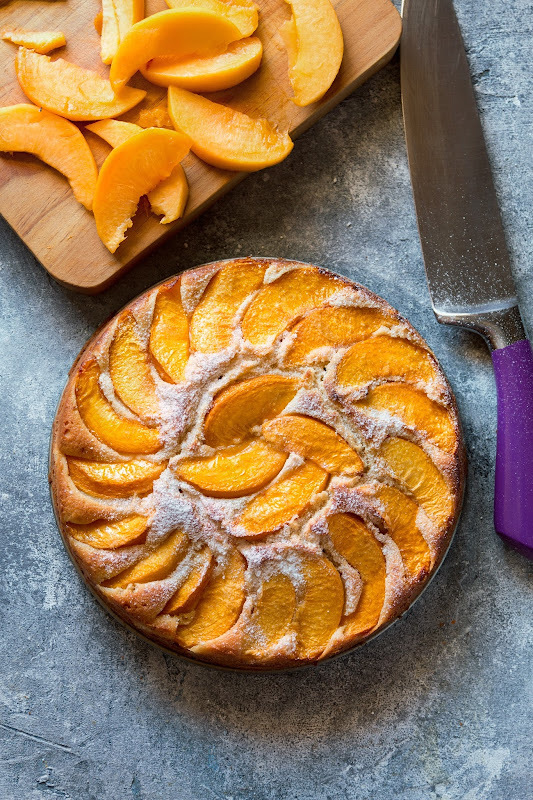 Top with sliced peaches and bake at 180ºC for about an hour(depends on your oven) or until lightly brown on top and the toothpick inserted in the center of the cake comes out clean. In the last 30 minutes of the baking time remove the pan from the oven and brush the peaches with melted butter. Return the pan to oven and bake until the cake is done. Sprinkle with powdered sugar and indulge yourself with a slice(in case you're not greedy😋) of this moistilicious cake! Add a spoonful of crème fraîche or greek yogurt,if desired.